Tuesday • July 30 • 2013 Volume 80 • Number 31 INSIDE: Menards n Bomgaars Presorted Standard US Postage Paid Permit #8 ECRWSS Vermillion, SD n bp Broadcaster Press n Dining n One In A VerMillion Postal Patron Local Since 1934 201 W. Cherry n Vermillion, SD 57069 n Phone: 605-624-4429 n Fax: 605-624-2696 n www.broadcasteronline.com The Surgeons and Staff at Lewis & Clark Specialty Hospital Dr. David J. Abbott Otolaryngologist Welcome Dr. Paula Hicks Ophthalmology Dr. Micah M. Likness to the Yankton area and our hospital! 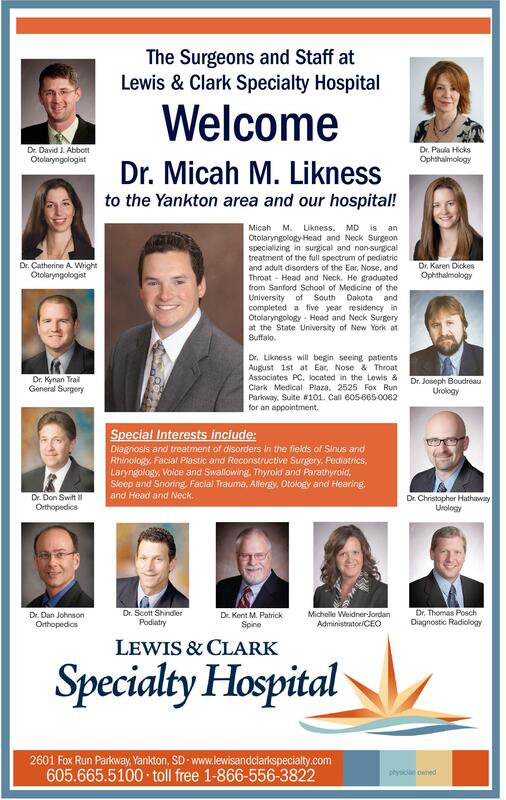 Micah M. Likness, MD is an Otolaryngology-Head and Neck Surgeon specializing in surgical and non-surgical treatment of the full spectrum of pediatric and adult disorders of the Ear, Nose, and Throat - Head and Neck. He graduated from Sanford School of Medicine of the University of South Dakota and completed a five year residency in Otolaryngology - Head and Neck Surgery at the State University of New York at Buffalo. Dr. Catherine A. Wright Otolaryngologist Dr. Karen Dickes Ophthalmology Dr. Likness will begin seeing patients August 1st at Ear, Nose & Throat Associates PC, located in the Lewis & Clark Medical Plaza, 2525 Fox Run Parkway, Suite #101. Call 605-665-0062 for an appointment. Dr. Kynan Trail General Surgery Dr. Joseph Boudreau Urology Special Interests include: Dr. Don Swift II Orthopedics Dr. Dan Johnson Orthopedics Diagnosis and treatment of disorders in the fields of Sinus and Rhinology, Facial Plastic and Reconstructive Surgery, Pediatrics, Laryngology, Voice and Swallowing, Thyroid and Parathyroid, Sleep and Snoring, Facial Trauma, Allergy, Otology and Hearing, and Head and Neck. Dr. Scott Shindler Podiatry Dr. Kent M. Patrick Spine Dr. Christopher Hathaway Urology Dr. Thomas Posch Diagnostic Radiology Michelle Weidner-Jordan Administrator/CEO 2601 Fox Run Parkway, Yankton, SD • www.lewisandclarkspecialty.com 605.665.5100 • toll free 1-866-556-3822 www.hatchfurniture.com Home of Great Ideas since 1934 201 W Cherry St. • Vermillion, SD Phone: 624-4429 • Fax: 624-2696 BroadcasterOnline.com FURNITURE &FLOORING physician owned Hatch Furniture & Flooring 109 East Third, Yankton, SD 605-665-4416 • 800-798-4663 M-F 10-6, Sat. 10-5, Evenings by Appointment Hatch Furniture 413 Pierce St., Sioux City, IA 712-252-7750 $500 OFF with purchase of $3499 or more $350 OFF with purchase of $2499-$3498 $250 OFF with purchase of $1799-$2498 $150 OFF with purchase of $1099-$1798 $75 OFF with purchase of $499-$1098 you choose 500 save up to $ or up to 48 months no interest! * Downtown Yankton & Sioux City *With approved credit. No other discounts apply. Furniture and accessories only, clearance items excluded. See store for details. Processing fee may apply.